Press CTRL + D to add the file called frmShoppingList.vb from the above folder into your project (or right click on the project and choose to add it as an existing item). 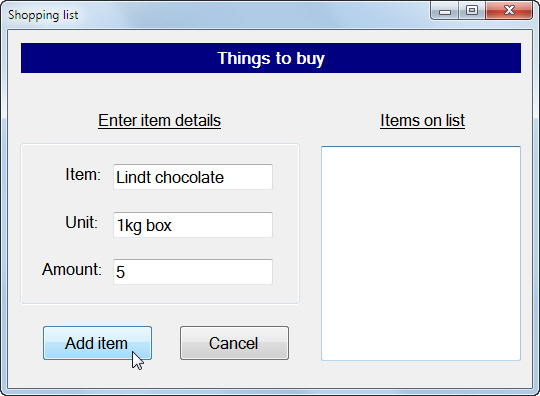 The idea is that clicking on the Add item button will make a new item appear in the list on the right. Create one public property for each of these private fields, to expose the value of it to the world. 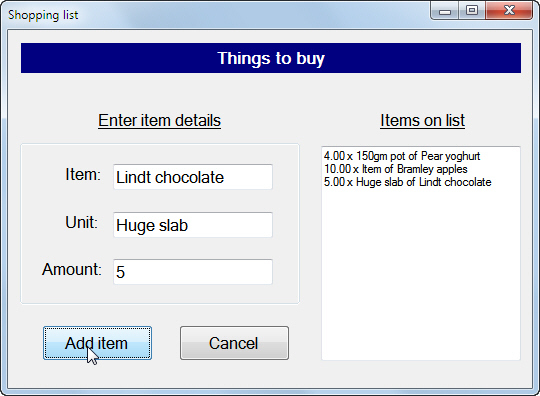 The only thing left now is to create the Add method for the ShoppingItem class. This should take a TextBox as an argument. See if your application works! Here we've added 3 items, and everything seems to be working well. You are now a VB guru!